I have been advised by my well-wishers to seek assistance from social media network and see the power of people. You would perhaps think that this is another needy person, but what you would not think about is my current state - mental and financial. The most gruesome pain for any son is to see his mother on ventilator. Words fail me as I sit to type this message with a hope that help can come from any door, in any form. 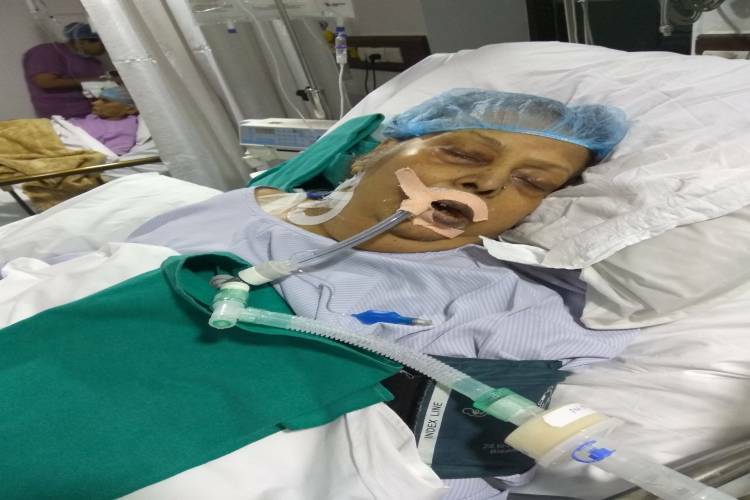 My mother is currently on Ventilator in ICU of Paras Hospital, Gurugram for almost 30 days. She has been diagnosed with Polynephritis with Sepsis shock and encephalopathy, along with Hypertension, Diabetes, and Rheumatoid Arthritis. She was admitted at Paras Hospital because she was having a lot of pain in the abdomen, loss of appetite, and severe loose motions. During the third visit, we were informed that the first-aid was not working and she was critical and had to be admitted. She even collapsed. We had no time to think of any alternative or the fact of taking her to a government hospital. Upon her admission, she was moved to the ICU and subsequently on the ventilator. Her condition became from bad to worse and were compelled to continue the treatment at Paras. Doctors are trying their best to save her life but this hope is diminishing with every passing day as she is sitting on a thin ice berg. Her weaning from the ventilator has failed repeatedly. 2) Removal of Pus on the left side of Kidney & from behind just over the Hips area. Also, she was operated in November 2016 for critical Urinary Tract ailment, for which the medical bill was for INR 1,50,000/-. At that time, we spent money in her treatment. She was under the treatment of Dr. Rajneesh. Given that the previous treatment was provided by Paras Hospital, we chose them again as they were familiar with the patient’s history. Other reputed Govt. Hospitals like Safdarjung and AIIMS are very far from my place and seeing my mother’s critical condition, it was advised not to shift her elsewhere. Further, my family has three members - Mother, Father and myself. My Father is 76 years old, who does not work and previously worked as Supervisor with Delhi Government on a contractual basis and retired in 2000. I am 37 years old, not very qualified and been jobless for the past 2 years because I have been diagnosed with Vascular Necrosis Stage II. This condition makes me limp and causes severe pain in leg when I stand up and walk because of which I could not continue any job. Previously, I worked as a Sales Executive in a store. It is highly unfortunate that I could not raise any money from the above efforts. However, I received around INR 2,95,000/- from friends and relatives - an amount totally insufficient to foot the medical bills. I am writing this message to request the readers to provide some solace to my mother’s sufferings in attending to the medical bill. It is in this context that I make an appeal to you to make any contribution for the above cause. Your share could be as good as a donation for KARAN SHARMA! Not everyone can afford to take care of their loved ones. KARAN SHARMA's life can only be saved by donations made by kind people like you.